Yesterday was the birthday of the famous early Baroque painter Michelangelo Merisi, who was born in Milan in 1571, and named for the Saint of the day. “Michelangelo” is a fairly common name in Italy, and he shares it with more than one artist of the same century, of whom the most famous by far bore the last name Buonarroti. The young Merisi would discover this to be a problem for his career when he came to Rome in 1592 at the age of 21, less than 30 years after the death of the painter of the Sistine Chapel, sculptor of the Pietà, and architect of St Peter’s; to set himself apart, he used the name of the village where his parents had been born, Caravaggio. More than one of his paintings was rejected after completion. 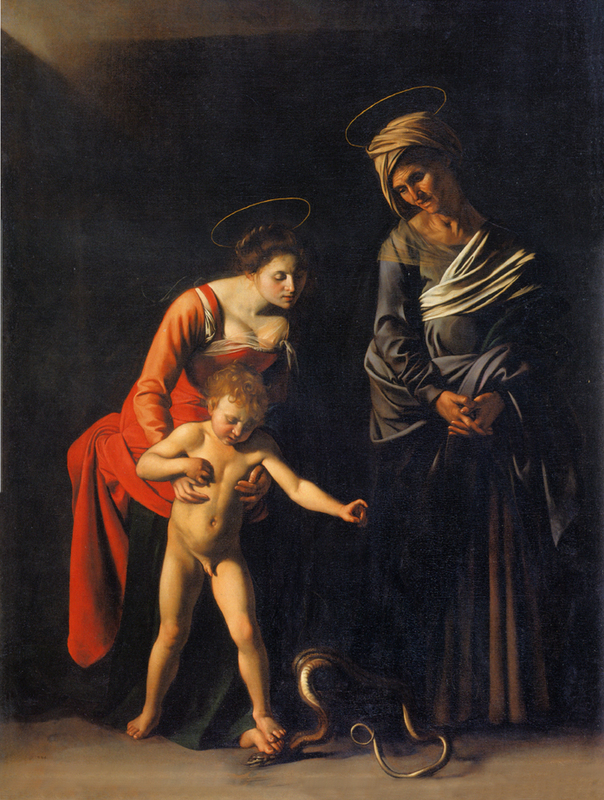 The best-known of these, the Madonna dei Palafrienieri (“of the grooms” of the Papal court), was first displayed in St Peter’s, but soon moved to the parish church of the Vatican, dedicated to St Anne, and thence to the private collection of Cardinal Scipione Borghese. Ss Joachim and Anne were traditionally held to have been childless for many years when they conceived the Virgin Mary by a special grace; therefore, by the time Mary herself was the mother of a toddler, Anne would be very old indeed. Caravaggio, who believed intensely in the use of radical naturalism and realism in his works, paints her as a very old woman, whose face has none of the sweetness one might expect an Italian (of all peoples) to show in the face of Jesus’ grandma. Much more importantly, the whole orientation of the painting, the lines and the sweep of the light, sends the eye downwards; this, and the intense darkness of the background, are wholly out of keeping with the architectural spirit of the churches in which it was only very briefly displayed, both of them bright spaces with bright domes that lift the eye up to heaven. The most famous of the three is the one now displayed in the Galleria Borghese in Rome, directly across the room from the Madonna dei Palafrenieri. It is possible that Scipione Borghese commissioned this shortly after becoming a cardinal in 1605. Jerome had served for a time as the secretary of Pope St Damasus I, and is therefore traditionally depicted as a cardinal, which the contemporary Pope’s secretary would normally be. In addition to a host of other roles, Card. 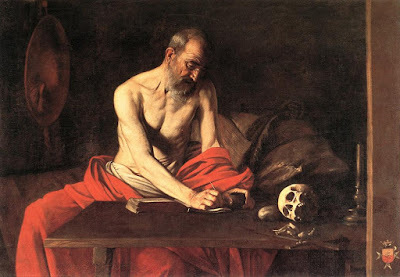 Borghese was made Secretary for Apostolic Briefs, the equivalent of Jerome’s position, by his uncle, Pope Paul V.
Caravaggio was trained in youth as a still-life painter, and never really learned to paint as anything else. He was completely dependent on models, and this accounts for some of the flaws in his work. The Counter-Reformation period laid heavy emphasis on the fact that St Jerome was not merely a learned man, but a monk, a response to the Protestants’ misuse of his learning in support of their theological innovations. His robes are therefore opened to show his body emaciated by an ascetic life of the kind rejected by the early Protestants. (This will become the standard way of representing him for the rest of the 17th century.) 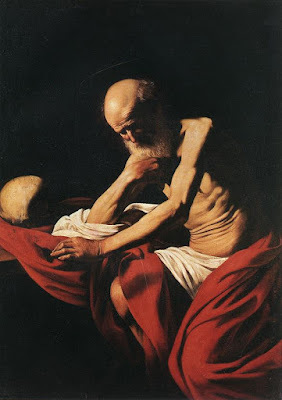 The anatomy of Jerome’s chest in this painting is not so much incorrect as absent; the elderly model simply cannot stay in that odd position long enough for Caravaggio to paint him properly. On the other hand, the figure on the left, whose model is long past feeling fatigue, shows no distortion at all. 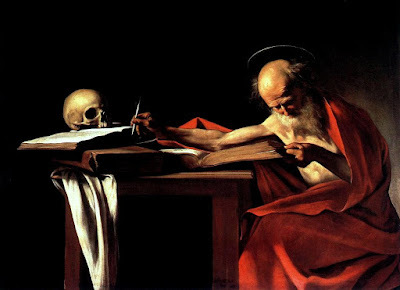 His other two paintings of St Jerome are less well known than that of the famous Borghese Gallery, but in point of fact both done rather more precisely. One of them, St Jerome in Meditation, is thought to be contemporary to the Borghese one, and commissioned for another Cardinal, Benedetto Giustiniani; it is now at the Museum of the Abbey of Montserrat. The same model is used as in the Borghese painting; for an artist who is wholly dependent on the use of models, it is easier to learn a face and use it repeatedly than to constantly learn new faces, and there are several models who appear in more than one work by Caravaggio. 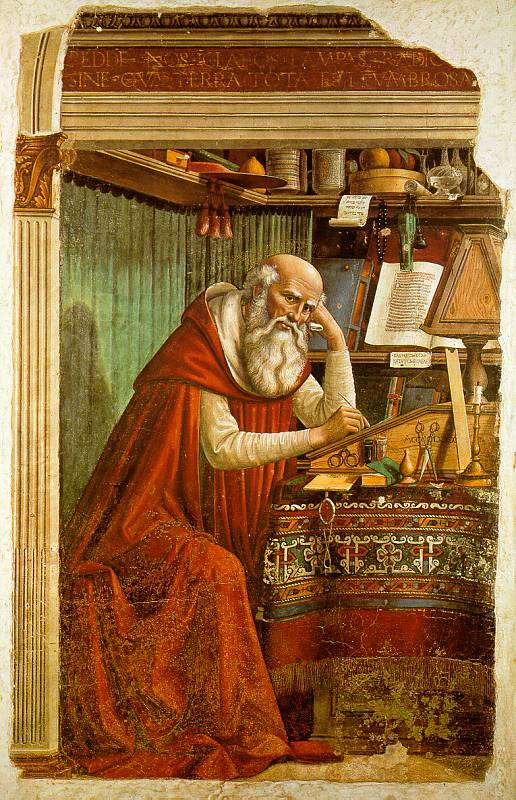 The less strained position has given the artist time to paint a much better figure in regards to anatomy; the background is now completely featureless, bringing Jerome the ascetic to the fore, with no hint of Jerome the scholar. The other dates from two years later, when Caravaggio had gone to Malta to work under the patronage of the Knights of Malta, and is kept in the cathedral of St John in Valletta. Here the various traditions for representing St Jerome are finely balanced. The scholar writes at his table, but the crucifix and skull show us that he is also a monastic and a contemplative. The table itself, which is almost sticking out at the viewer, the section of a wall on the right, and especially the wall on the left where the galero hangs, create a much more realistic sense of space. (The galero also reminds us, against the idea of a “Protestant” Jerome, of his close association with the Papacy.) Most notably, the radical chiaroscuro of the earlier paintings is considerably tempered by the lighter background; it is a far less showy painting, one which speaks of an artist who is maturing. Caravaggio is today known by many for the shocking realism of some of his works, such as the very bloody “Judith Decapitating Holofernes” in the Barberini Gallery in Rome, or the “Martyrdom of St Ursula”, which captures the very moment at which she is shot in the chest with an arrow. It is probably fair to say that that is what makes him so appealing to modern tastes, just as it made him widely detested in the 19th century. (One English guide book of Rome which was well-known in that era did not mention his “Madonna of Loreto” in its description of the church of St Augustine.) And yet it is in the painting of an elderly man quietly working in his study, or alone in silent contemplation, that we see this maturation taking place.